This is a re-post of a tutorial I did last month for Pellon. 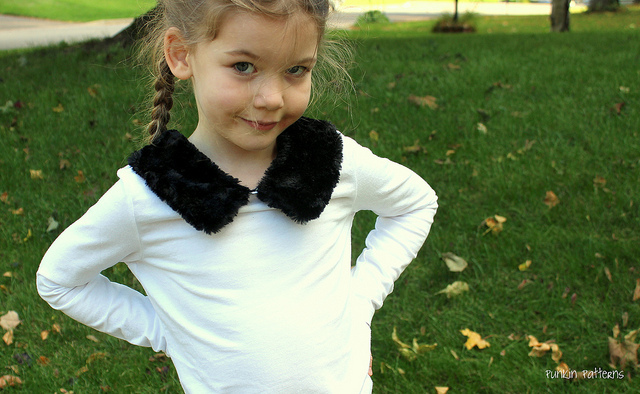 Adding a quick faux fur collar to a plain t-shirt or blouse can make any shirt ready to wear to a party. 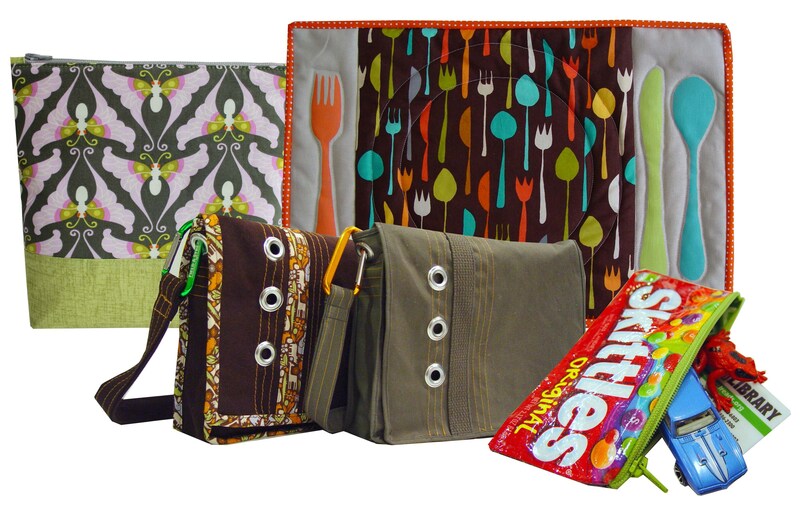 It is a very simple and quick project. 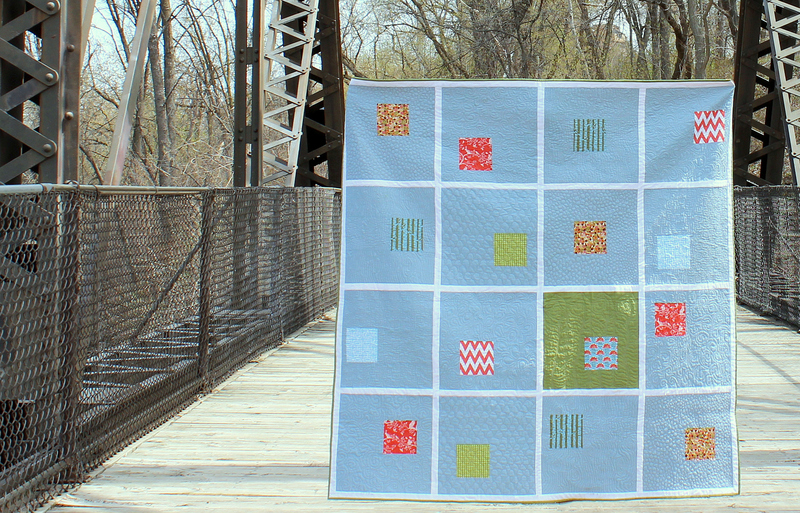 This tutorial uses a child’s size t-shirt, but this can be used for any size shirt. You’ll need a t-shirt or blouse, some faux fur fabric (you’ll need fur with some stretch if you’re adding it to a t-shirt) and Pellon Fashion Fuse interfacing. 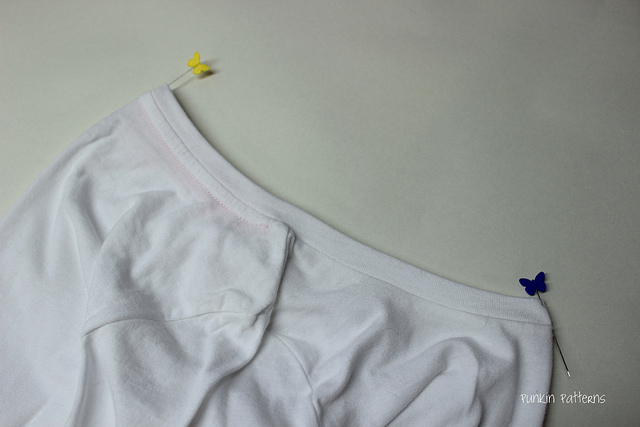 Fold the t-shirt in half (front side out), matching shoulder seams. 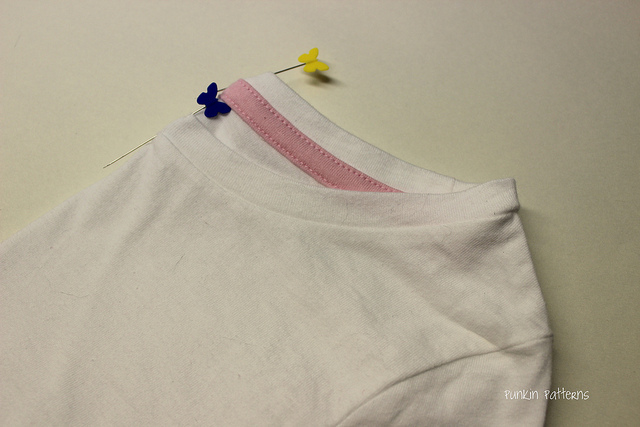 Pin the fold of the shirt at the neck edge on both the front and the back. Open the shirt flat. The centers are marked with pins. Move the shirt so that the center points are at the sides and the shoulders and sleeves are lying in the center of the shirt as show. 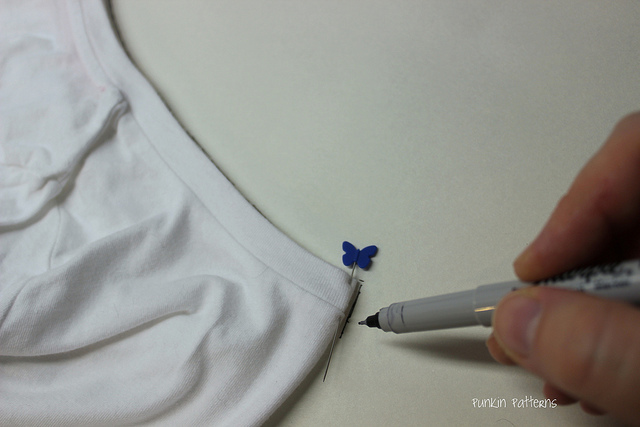 Place the shirt on a large piece of drawing paper or Pellon Easy Pattern. 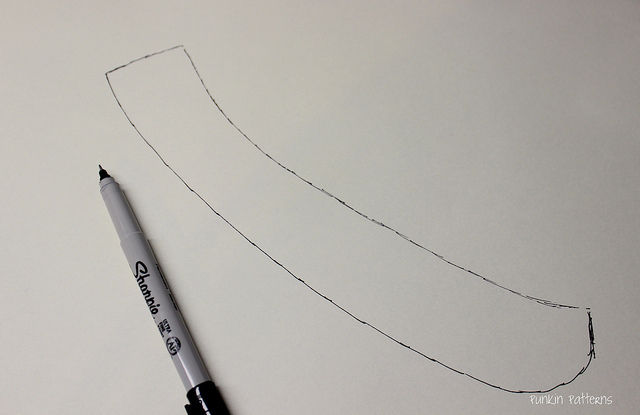 Trace the edge of the collar with a pen. Mark where the front and back of the collar are. 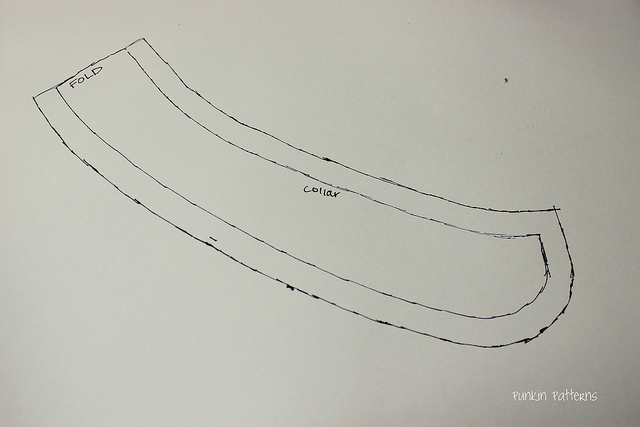 Draw the rest of the collar as desired. 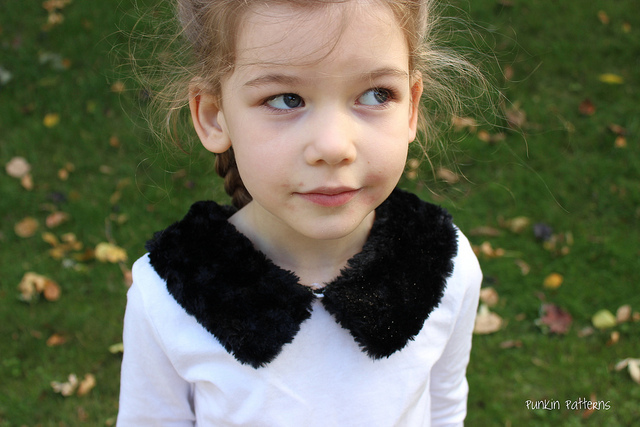 I used a Peter Pan (slightly curved) shaped collar. The collar can be any shape or width. 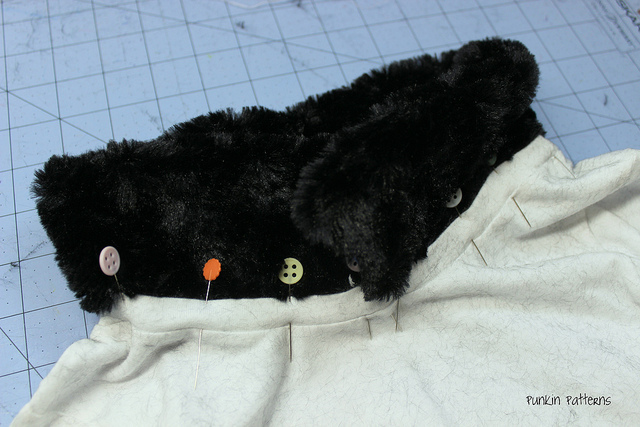 Add 1/2″ all the way around except at the back where the collar will be cut on the fold. 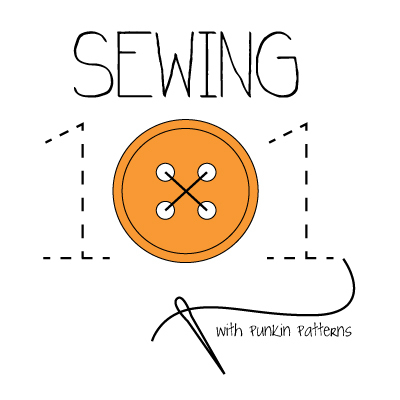 This is the seam allowance. Mark the fold line on the pattern and cut out. 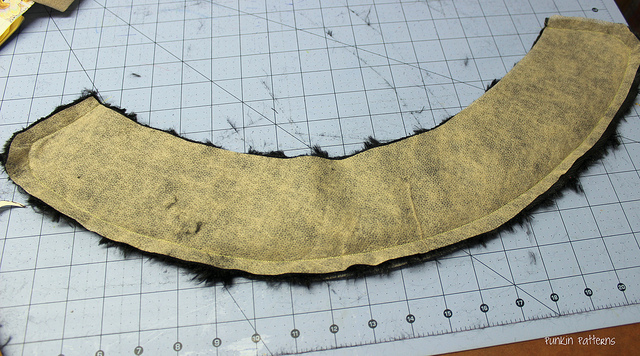 Cut out two pieces each of fur and Fashion Fuse on the fold. 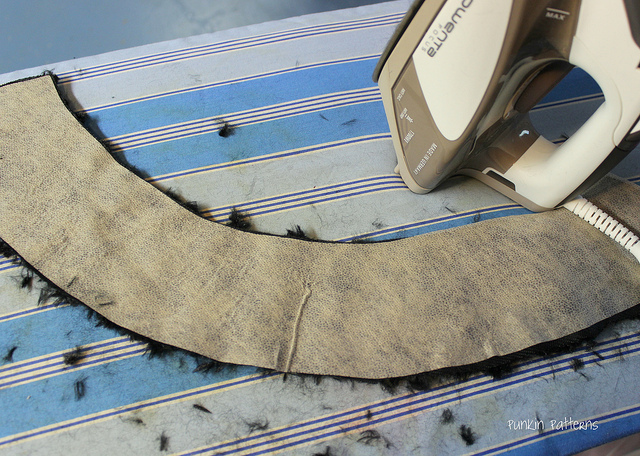 Place one side of the fur collar right side down on the ironing board. Place one piece of Fashion Fuse on top with the rough side down on the wrong side of the fur. Fuse following manufacturer’s instructions. Repeat this step for the other collar piece. 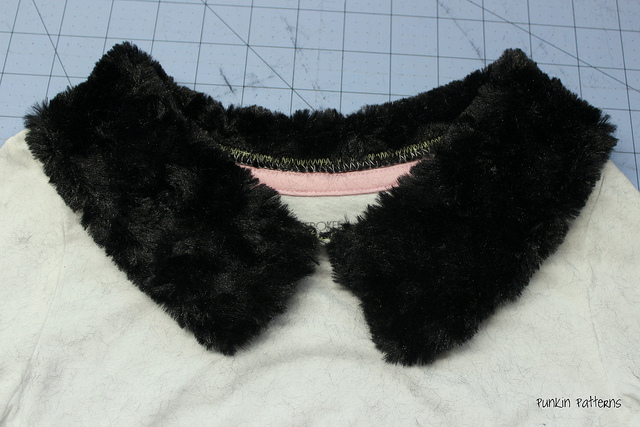 Place the two collar pieces right sides together. 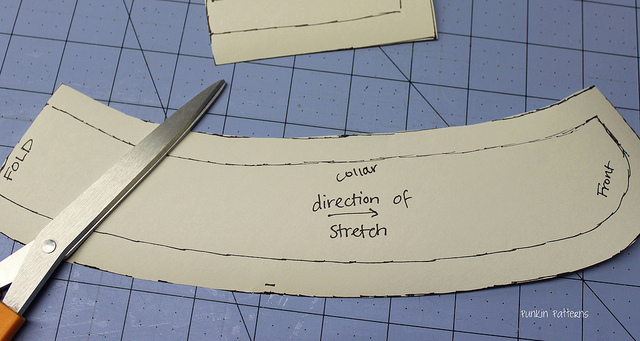 Sew around the collar using a 1/2″ seam allowance. Leave the edge where the collar will be joined with the shirt unsewn. Trim seam allowance to 1/4″. Turn the collar right side out. 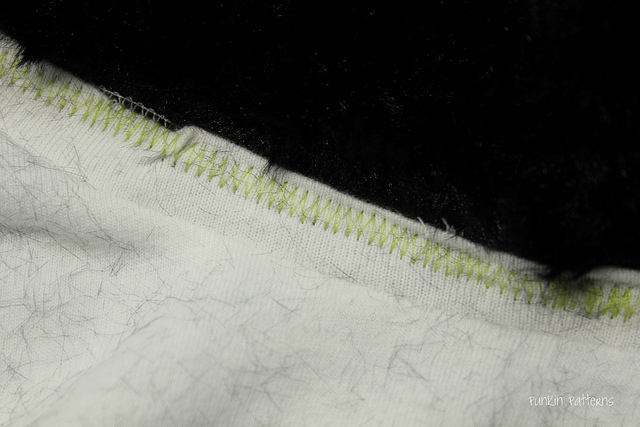 Stitch the open side of the collar closed using a zig-zag stitch or serger. 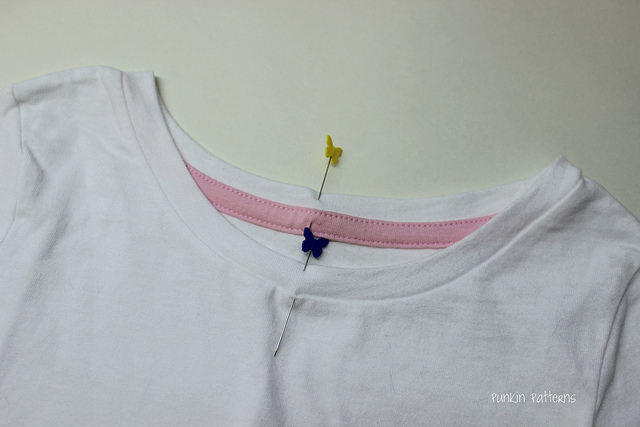 Pin the collar to the t-shirt so that the zig-zagged edge is on the inside edge of the collar. Align the center of the collar with the center of the back and the ends of the collar with the center of the front of the shirt. 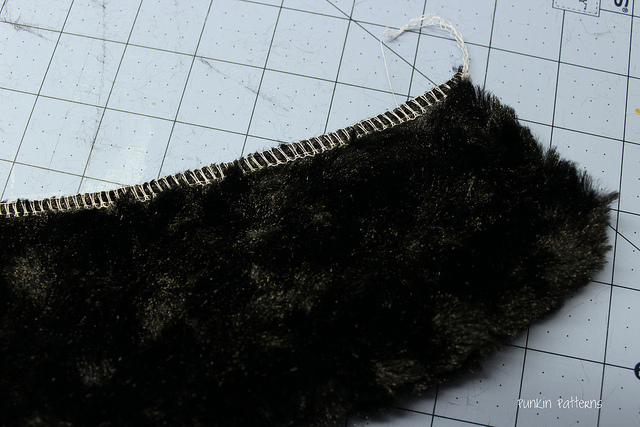 Sew the collar in place using a zigzag stitch. If the collar is non-stretchy, a straight stitch can be used. A quick brush with a lint brush will remove any small bits of fur and your shirt is done!